An employee’s workspace has a huge effect on their level of productivity. Things like ergonomics, comfort, and lighting are all important factors that come together to create an ideal working environment where people can be safe and productive. In shared workspaces, it’s even more important to get these factors right because of the large number of people using the indoor space. It’s not enough to have bright lights in every corner of the room; your lighting has to be attuned to the needs and situation of every worker in the shared workspace. With that being said, here are four basic steps you can follow to properly light your shared office spaces in Dallas. The brighter the light in a workspace, the better it is for workers, right? Wrong. Too much light can be a distraction as it causes glare, which in turn leads to eyestrain. Imagine working in front of a computer under the glare of several lights—not exactly what you would call a comfortable working situation. The best way to know if an indoor space is bright enough is to follow the general rule of brightness per square feet. That is, to have 20 lumens (the measure of brightness) of light for every square foot of floor space. A 250-sq.ft office, for example, would have 5000 lumens of light. But note that different rooms have different rules. For example, while lobbies and the general floor area need 20 lumens per square feet of space, raised work stations and desks will need about 50 lumens of light per square feet. Getting great office lighting isn’t as simple as installing a few light bulbs here and there. For a workspace to be usable, it has to have layered lighting. All these different layers of light contribute to a cohesive workspace where staff can feel productive and work properly. Dimmers offer a great way to add lighting flexibility to individual workstations, giving workers the autonomy to set their desired brightness according to their activities. When paired with smart lighting, dimmers can be set to automatically switch the lights on and off at specific times of the day, ensuring that lights aren’t accidentally left on after office hours. In a shared workspace, the brightness of your lights isn’t the only thing that matters. 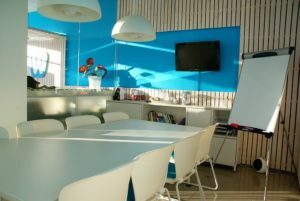 Color temperature also has a significant impact on the appearance and mood created by your lights in a shared office space. Color temperature refers to how “cool” or “warm” the light produced by a lamp looks, based on the Kelvin scale. 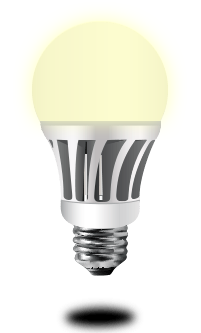 Basically, warm lights have a yellowish glow while cool lamps have bluish-white light. This is important because the temperature of your lights can interact with computer screens and affects your vision. For example, a lamp with a color temperature that’s too cool can cause unpleasant. On the other hand, lamps that are too warm can be too much a contrast with computer displays, causing eye strain as a result. For best results, look for lamps with a neutral temperature in the 3000K-3500K range. Keep these lighting tips in mind when choosing bulbs for your shared office space to create a comfortable work environment for everyone.